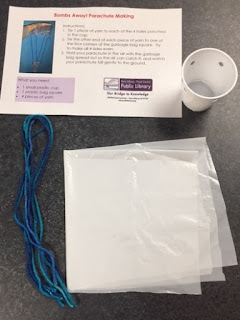 Science Activity Packs are back at my library this year! For the full list of the activity packs we're offering, click here! What happens if you put something heavy in the cup? Something light? What happens if you let the parachute go from different heights? Does size matter? Can you make a smaller parachute? Does it fall differently?